Superior client service is at the core of everything we do. We are committed to accommodating our client’s specific needs and requests and ensuring expectations are always exceeded. 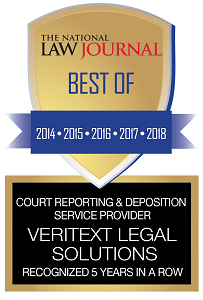 Stellar service is why we’ve been voted time and again as one of the best court reporting companies by the legal communities in New York, New Jersey, Atlanta, California, Florida, Chicago, Philadelphia, Washington DC and across the nation. It’s also why 98% of Veritext clients tell us why they would recommend us to their colleagues!